Art Talk: Bad Girls Birthday Bash! Bad Girls Kits is 2 years old!!! WOW! So, in celebration of this momentous occasion, we are offering a swwwweeet prize pack for a little member participation! For the Birthday Bash Bad Girls will be offering a Huge Prize Package that will include a Great Kit from Wendy and some free classes. A) you will need to make a blog post on your own blog about why you love shopping at Bad girls, what you love about the kits, and why you love our online classes. B) **Also you will have to post a photo of either your all time favorite BG's kit or your favorite BG's Class! C) Then return to the Bad Girls Blog and leave a comment with a link to your blog! Sounds fairly easy right? ***For additional entries to win the prize you can post that same information on facebook, myspace, the designers blogs, etc. and link that in your blog post! I love the way you do collage your art work is collage and mine is to but we are so totally different . I posted about the birthday bash on my blog! 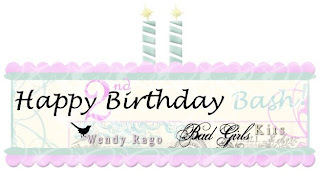 I also posted about the Bad Girls Birthday on my blog! I love the new products that Bad Girls are carrying. Plus, I really enjoyed your class Jen. Thank you for sharing your cool techniques! Hi Jen!!! I am so glad that Bad Girls is keeping the classes up for good. I want to take your alternative printing class sometime soon! I am loving your life enhanced class!